The Right Technology. The Right Solution. Don’t waste time and resources. Place a call to your secret weapon, Eastern Solutions. We will help you stay ahead of technology with highly trained service professionals that give you the perfect blend of technology and field service experience when you need it most. Using visual technology, Eastern Solutions will quickly assist your business by reducing non-productive time (NPT) with highly trained field service technicians. Our Downhole Camera (DHC) Service and technology will provide you with the perspective you need for more effective intervention strategies, saving your business time and money. When you can see the problem, you can fix the problem. A picture is worth a thousand words… Take advantage of the latest technology with Eastern Solutions. 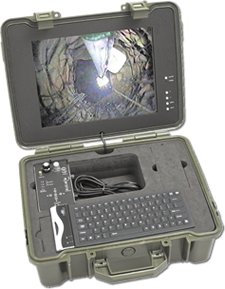 Downhole cameras and imagining technology will give you a first-hand look at what is going on in your well. 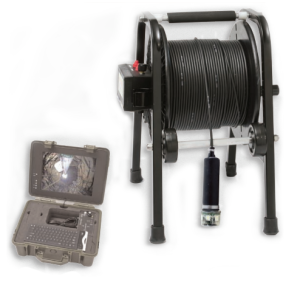 Proven in a wide range of water, oil and gas well conditions, this advanced downhole imaging service allows you to literally “see” borehole conditions. For reliable quality inspection, nothing speaks louder than a picture. You can have confidence in the solution when you see it first-hand with Eastern Solutions. With extensive field experience, rely on Eastern Solutions to deliver a whole new perspective to your next project. Let us give you the visual information and confidence you need to take proper remedial action in your well. We’re ready when you are. Let’s improve your perspective together! The new viewing/recording platform for all Vision Systems Unlimited products. Backwards compatible with all Well-Vu products. Camera has 180° lens which shows twice as much detail as a standard lens. This allows for viewing the sidewalls as well as down the well all at the same time. This camera can be attached to almost all previous models.